On 3rd January, Prime Minister Narendra Modi unveiled a plaque for the foundation stone of a New Helicopter Manufacturing Unit of Hindustan Aeronautics Limited (HAL) in Tumkur District in Karnataka. Speaking on the occasion, PM Modi said that the manufacturing unit coming up in Tumkur would not be an ordinary one, but one which would make the whole world take notice. Prime Minister Modi said the Indian Armed Forces were second to none, and now the time had come to ensure that the Weapons and Equipment they carried and used were also the best in the world. For this, he said, India needed to end dependence on imported weaponry, which is expensive and is not of the latest technology. PM Modi said the Union Government has decided to lay stress on manufacturing of Defence Equipment. 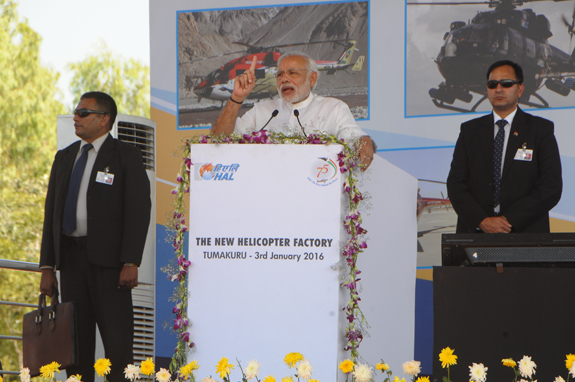 He said the helicopters manufactured in Tumkur will serve soldiers stationed in remote locations.The PM said that the first helicopter built in this unit should take flight by 2018. He added that 4,000 families will directly or indirectly get livelihood due to this factory. He recalled Dr. Babasaheb Ambedkar's vision for industrialisation in India, as a means to empower the poor and downtrodden, and said this manufacturing unit is also a step towards fulfilling that vision. The Governor of Karnataka Vajubhai Vala, the Chief Minister of Karnataka Siddaramaiah, Union Ministers Manohar Parrikar, D.V. Sadananda Gowda, Ananth Kumar, and Union Minister of State G..M. Siddeshwara were present on the occasion. Prime Minister Narendra Modi said he is seeing his ‘Make-in-India’ dream getting realised in the real sense as he laid the foundation of the New Helicopter Unit at Bidarehalla Kaval in Gubbi Taluk of Tumakuru, about 100km from Bengaluru. Driving home the need for India to attain self sufficiency in Defence Production, PM Modi said though the country is spending huge amounts to import modern weapons from other countries, what we get most of the times are outdated technology systems. "There is a greater need to manufacture modern war equipment and tools that would help our soldiers to operate in today’s tough situations. The HAL Unit in Tumakuru would go a long way in making India self-reliant in manufacturing indigenous systems and make India self-reliant in defence needs," he added. Defence Minister Manohar Parikkar said the Tumakuru Unit would launch its first chopper in two years and aims to manufacture 600 Light Utility Helicopters, that would be added to Defence Wings, in the next 15 years. The unit will also provide 4,000 jobs with an investment of R.5,000 crore from Government of India. HAL’s greenfield project in Karnataka is to make helicopters for Transport and Defence needs. “Self-reliance in the area of security needs is crucial. We have to make our own weapons and ‘Make-in-India’ is a step towards achieving it,” Prime Minister Modi said. Laying the foundation stone for HAL’s greenfield helicopter project, PM Modi said: “If India has to be self-reliant in its security requirements, our Armed Forces need the latest and modern equipment. We have to make our own weapons. Making weapons in India rather than importing them is our motto and it is the backbone of our ‘Made-in-India’ programme.” PM Modi said the country spends crores of rupees to import Defence Equipment, but receives relatively outdated technology and equipment. “If we buy in 2016, we get delivery not earlier than 2020. At present we import weapons from other countries to equip our Armed Forces. Now, we have made it a policy that before striking a deal for weapons, the Government puts in a condition in the agreement to make a part of the weapons in India,” he explained. “A facility like this (HAL) will not only strengthen the Armed Forces, but also realise the dreams of Babasaheb Ambedkar, who was a champion of industrialisation,” he added. Karnataka Chief Minister Siddaramaiah said the State has taken steps to get the project implemented at a fast pace. Some 610 acres of Government land has been allotted and transferred at a concessional rate of R.1 lakh an acre, he added. Defence Minister Manohar Parikar said the HAL Facility will make helicopters for both Transport and Defence needs. HAL, he said, has set a target to manufacture 600 helicopters from this facility and as much as R.5,000 crore will be invested, which will provide direct and indirect employment to about 4,000 people.